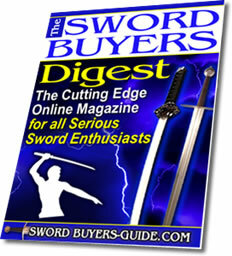 Our second Clyde Hollis interview, the original owner of Generation 2/Legacy Arms Swords, was conduced in January 2007. As a point of reference, this Q&A session was conducted by Mike Harris (aka ShooterMike) from the SBG Forum. Mike: Hi Clyde. You are a member and frequent participant on the SBG forum. I have been impressed with your level of interest and participation. It was that level of interest, and your obvious desire to get feedback from the rest of us, that gave me the idea for this interview. 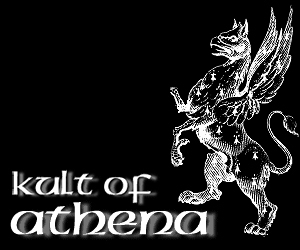 I think a lot of forum members here would like to read a bit more about you and Imperial Weapons. Thanks for giving me the opportunity to talk with you. Clyde: It is my pleasure and an honor to do these interviews so people are more informed about the Generation 2 line. M: I think our readers would like to know the background of Imperial Weapons and the Generation 2 line of swords. When did you start Imperial Weapons? What drove your decision to start the company and enter this market? C: I have always had a love for swords after I started in role-playing. I bought my first sword from a dealer at a gun and knife show outside of Memphis, TN. It did not take long after that until I started selling swords as a hobby. Well, from there I left the fantasy side and moved more to the Historical side. I saw a need that we as weapons dealers have to educate the public in the true reason and function of the sword, not what you see from Hollywood. M: What were some of the difficulties you encountered getting started? C: Money. Always needed more money to operate. When I started in business we had to produce a catalog (yes it was that far back, before web sites) and that cost a lot of money. Now, with the internet, we do not produce a catalog because of the cost and time to produce them. Also another difficulty was time. I was working 50 to 60 hour weeks at a full time job and trying to get this business off the ground. After 5 full years of this, and with the Lord's help, here we are. 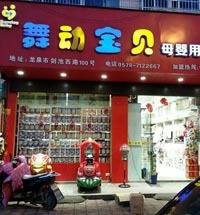 We are by no means a big company, as many of you know, because I still have to answer the phone a lot. But we are growing. M: There is a lot of outsourcing of parts in this business. 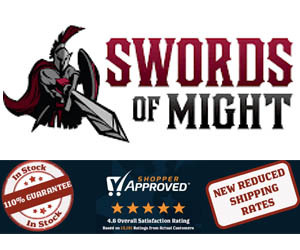 With high labor costs in the U.S. most sword-making companies have their swords manufactured overseas. Where are the Generation 2 swords manufactured? Can you tell us a little bit about the challenges in dealing with these long-distance business relationships? C: We use the Philippines. 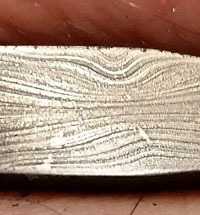 But there is only one foundry that we use, and they make exclusively for Generation 2. I have said it before and I don't mind saying it again. I am very patriotic and since I cannot afford to have them made here, I do use a democratic country to make our product. Nothing against other manufacturers, it is just my convictions and preference. 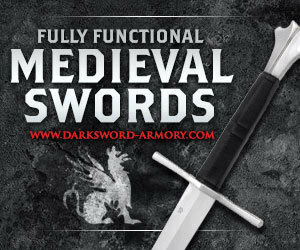 M: What quality control steps do Generation 2 swords go through, both at the point of manufacture and at your location in Tennessee? C: I have noticed we have less than 1% quality issues. 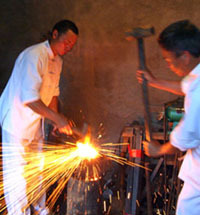 At the foundry is where most of the quality control is done. We have 2 people in charge of inspecting each blade before it goes to be fitted and then 2 people who inspect each item before being coated in petroleum jelly and wrapped to protect it from rusting on the voyage here. M: Your return/replacement policy is arguably the best in the market. Would you explain this policy and tell us what made you decide to offer this level of guarantee? C: For up to one year we guarantee our product (when under normal use, not abuse). We will give a one time replacement no questions asked. But if we see it has been use for chopping a tree, rocks or using baseball bat swings during sword play (and we can tell by looking, we have been in this business over 12 years) we will not replace it. No sword will stand up to obvious abuse. But I would like to add, that you have to be under the supervision of a trained instructor. We do not want someone untrained going into his or her backyard, or someone else’s backyard, and swinging at another sword or any object or cutting target without being trained. It is very dangerous. These pieces are first works of art and they are instruments, or tools if you will, and you have to be trained to use them safely. 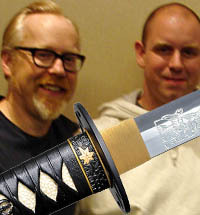 M: You have been very active in designing and bringing new swords to the market. How many different models have you created and sold over the years? How many of those are still being manufactured today? C: Boy, let's see. At least from memory (and as I get older trying it slips away from me) I know of 13, there may be more but at least 7 are still being made now. M: What drives the decision to cease production of a model of sword? C: If it does not move well, it is not cost effective to keep it and we need the shelf space for items that will move well. M: Over the years, you have manufactured several items on a limited basis, such as the Halfling sword and various models of Bowie knife. What drives the decision to offer limited-run items? Do you ever re-offer any of these items by manufacturing a second production run? C: If it is a unique market, and yes the sword market itself is a unique market, but like the hit movie "Lord of the Rings" was a unique niche in the sword market, so we knew to get more people to by the Halfling and the Twin Elven Daggers we needed to do limited runs. he same is true with our Bowie Knives. We have been told we are the only ones to make them not only useful (Tempered Carbon vs. Stainless Steel) but we made them affordable and at a great quality level. Now with that we could just keep making each knife, but the people who buy these knives, they want to know that they really have something that not many people will have. So we have limited the number to just 200 each. Now once that number is made we do not re-make it again, unless there is a drastic change in the look of the item. The Halfling sword we did not make all 400 pieces. This movie run died down, so we halted production because the demand was low. If they come out with the re-make of the Hobbit soon we just might start the production of the Halfling sword again. 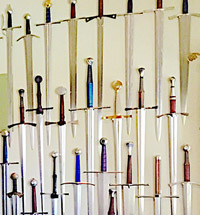 M: In the past, a few in the sword community have criticized Generation 2 swords as being overly heavy, perhaps “over-built” and not historically accurate. What would you say to these criticisms? C: They need to take a new look at Generation 2. The weight, balance, feel and look has changed. It has not come all at once but over time to ensure we keep a durable item. M: Of all the swords you’ve offered over the years, what is your current personal favorite Generation 2 sword? C: Well I do not have just one favorite item. My first love was the Irish Hand and a Half sword, next comes the Lucerne and then all 3 Bowie Knives. M: You have now begun working with Hank Reinhardt, offering a new line of signature series swords. Could you tell us a little about how that happened, and anything about your future plans for this project? C: Well, when I was in the Philippines in Feb 2006 visiting our foundry, I received a call from Diane, my beautiful and very patient wife (yes she has to be to live with me) that Al from Last Legend wants to talk to me. So I asked her give him (Al) the number where I was at. He floored me with this statement. "Clyde, I just got off the phone with Hank Reinhardt, he called me and stated that he would like to work with us in having some items made and I said sure but there is more than just Last Legend. Clyde from Generation 2 also works with us, and us with them, so you would basically have 2 foundries to work with." I was speechless for a moment. My next words were "THE Hank Reinhardt"? Al replied "Yep". And it has evolved from there. In case some of you do not know. We (Generation 2) and Last Legend have worked closely together for many years. Now we are working even closer with the new ProSword line. We are very excited as well to be working closely with Hank, and look forward to many new historical items coming down the line. We are also looking forward to carrying a book Hank is finishing up right now and it has to do with what he does best. 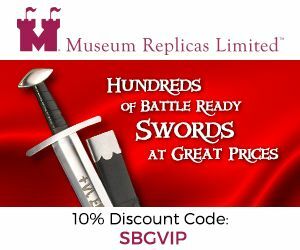 "Sword Fighting"
M: Are there any final comments you would like to address to Sword Buyer's Guide visitors or SBG forum members? C: It has really been fun seeing SBG growing as well. I want to say I really enjoy and thank each one of you who give feedback and some ideas. Keep that going. 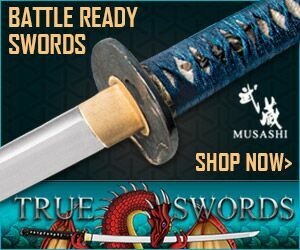 I really enjoy the post on Your Favorite European Sword. Many of the ideas have been rolling around in my head. But as empty as my head is, it has a lot of room to roll around ha-ha. Keep up the ideas and definitely keep up the reviews, they really help.